Yumi was born in Tokyo, Japan. She studied under Ukai Uchiyama, Japan's master watercolorist. Yumi did a variety of illustrations for children's magazines and books while she was a student of KEIO University. After graduating with a BFA, she studied at the Academy of Arts College in San Francisco. From 1982 to 1985 she lived in Holland to study the works of the great Dutch masters. Yumi was also the president of the La Jolla Art Association from 1996 to 1997. "I am a plein-air painter, focusing on the colors and light that nature creates. A painting that doesn't have to be explained — but simply portrays a feeling to which people can relate — is communication. If my paintings would give people the feeling of Love, Harmony & Peace, I would be content." Yumi was awarded the key to the city of La Mesa for her outstanding teaching contributions made to the La Mesa community and won numerous National & International Awards. Yumi now resides in San Diego, dedicated to her art. Yumi's limited edition lithographs "Boating", "Black Swan" & "Water Lilies" were published. The video, "The Colors of Yumi" was produced. Won numerous national & international awards. Appeared on TV during her exhibition in Los Angeles. From 1994 - 1996 her work was featured on the cover of SEIKEI KAISHI magazine. A series of Instructional Painting Videos were produced & continued. Special Exhibit, 'Night & Day', was held in La Jolla. Yumi was featured in the September Issue of the Japanese newspaper YUU YUU. Completed the mural "People Helping People", for the City of La Mesa. "Light, Tokyo-Holland-San Diego" was held in Tokyo. Yumi was awarded the key to the city of La Mesa for her outstanding contributions. Various Art Lectures and Painting Demonstrations by Yumi continued. Yumi wrote for ARIKA, a monthly magazine in Japan. The Annual Art Exhibition of NIHON KOUGYOU CLUB in Tokyo. Completed the Public Art for the City of La Mesa and SDSU Business District. She played a painter for the stage production, "Every Painting Tells a Story". The Japanese magazine "Light House" (Nov 2009) featured Yumi. Her Annual Art Exhibition "Symphony of Light" at Gallery 21. Her Annual Art Exhibition "Beyond the Light" at Gallery 21. Finished 2 Public Arts for the City of San Diego. Her painting "A Girl by the Lily Pond" was exhibited at International Plein-Air Art Competition by San Diego Museum of Art Artists Guild. Her Annual Art Exhibition "Contrast of Light" at Gallery 21. Completed 1 mural and 15 Public Art projects in San Diego and La Mesa, CA. Yumi was featured in the Sep 16 issue of Light House magazine. 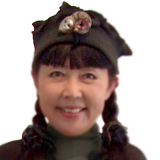 Please Contact Yumi to: Schedule a Lecture; Demo; Workshop; and/or to Judge an Art Show.